From Charlie’s wardrobe, which he apparently stitches back together frequently, to Mac’s tough guy t-shirts that conveniently have no sleeves for maximum movement when being a complete jerk, the Gang has a style all their own. One thing they all have in common is that everyone in the gang wears their fair share of t-shirts, except for Dennis who prefers dress shirts and polo shirts to tees (I always assumed he wears these instead of t-shirts so he can more quickly take them off when he needs to impress a lady). This list will show you some of the all-star t-shirts worn by the gang. Many of the items in Charlie’s wardrobe resemble shirts that an 8 year-old child from the 80s would pick out, or maybe a deranged metal fanatic, but either way their sheer peculiarity is amusing combined with Charlie’s child-like nature from the show. Charlie’s most recognizable t-shirt, the horse t-shirt, makes multiple appearances on the show. He wears it on 8 (possibly more) episodes and it appears that Charlie has had it for multiple decades, as you can catch a glimpse of it during Charlie’s flashback in "A Very Sunny Christmas" episode in season 6. Kid Charlie wears it while opening his gifts from the “Santas” who come to cheer his mom up during the holidays. It’s the shirt that doubles as Charlie’s sleepwear and his funeral attire, as he has no problem wearing to the funeral of Dennis and Dee’s mother. If Charlie’s horse shirt wasn’t enough, he’s got more shirts with creatures in fantasy settings on them. This Panther T-Shirt might make you wonder if Mrs. Kelly is still picking out Charlie’s clothes, but then again, Charlie’s favorite game is "nightcrawlers", which is exactly what it sounds like. This shirt pops up in a few episodes, but most memorably during his declaration of being a crab person during "The Great Recession". No one knows where Charlie found a retro shirt with the Magna Cigarettes logo on it, but there’s a fairly high chance that he found it on a dumpster run, or perhaps a Santa gift when he was a kid. It does have a strange resemblance to The Strokes’ logo though. Mac likes two things in a t-shirt. First, it needs to have a phrase or punch line on the front—preferably one that highlights his “intellectual” nature (after all, he is the brains of the group). Second, if it has sleeves, they have to come off. Through the course of the series, Mac has expanded his look by actually leaving the sleeves on his shirts and even wearing some Acapulco floral shirts when he cultivates mass to become Fat-Mac for season 7, but no matter what Mac wears, he can never seem to fully portray the tough-guy persona that he wants everyone to see. Mac starts off the series strong with this highly controversial t-shirt. Mac’s tries to show support for the pro-life camp with the Death to Baby Killers t-shirt, mostly in an effort to get physical with one of the women spearheading the campaign against abortions. Of course, Mac might not be able to appreciate the hypocrisy in this bold shirt, but that’s the best part about the t-shirts Mac wears—he never seems to fully understand what any of his shirts imply. Come to Philly for the crack? 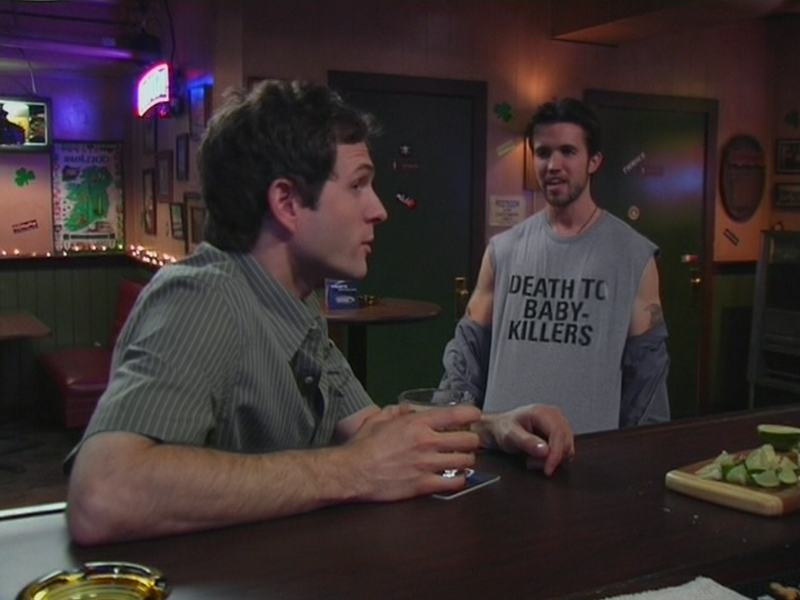 This shirt winds up in the beginning of the second episode of the show, where Dennis even points out Mac’s affinity for t-shirts with cheesy phrases on it. Sometimes Mac fancies himself the Sheriff of Paddy’s, other times he thinks of himself as some sort of high action ninja, hence a ninja shirt. No matter what kind of apparel Mac wears, you can put money on the fact that it will simultaneously reveal him to fall short of what he thinks himself to be. What kind of ninja advertises that he’s a ninja with a shirt? C’mon Mac! Mac tries a little too hard with the “cool party guy” vibe and often just comes off as looking like a jerk—this time is no exception. The shirt looks like something a 20-something college student wears to the bars on St. Patrick’s Day, which is perfect if you’re a 20-something guy heading out for a night of fun in March. 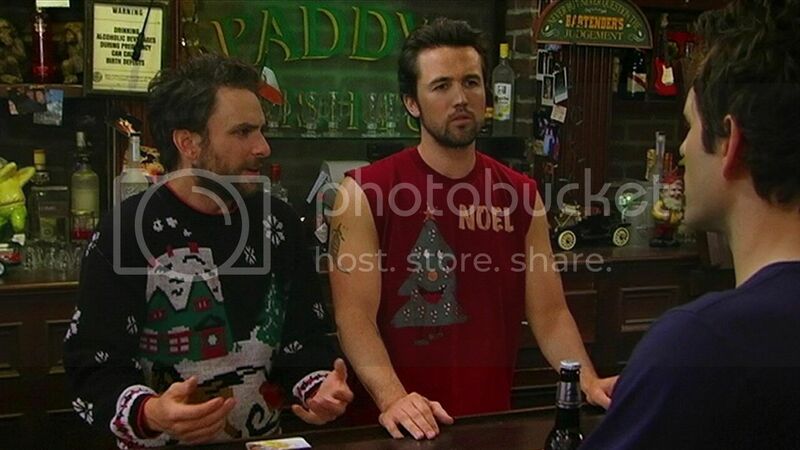 Mac is a 30 year old bouncer wearing it while he listens to Dennis’ presentation on how to manipulate and objectify women by playing with their emotions. Unlike Charlie, we rarely see Mac wearing the same shirt multiple times. One shirt that does show up a few times is Mac’s Riot t-shirt and it does seem to flow right into Mac’s self image. The self-declared Sheriff of Paddy’s needs shirts like this to reassert his macho authority to all the would-be threats to the group during one of his ocular assessments. Mac loves Christmas traditions he’s obviously willing to let his guard down a little bit during the season by wearing a goofy Christmas tree cartoon character t-shirt for the holidays. Don’t worry though, as Mac decided to cut the sleeves off this one to make sure that everyone knows that he’s still a tough-guy, even though he has a cartoon tree on his shirt. It was important to include a Fat-Mac t-shirt, since Mac has no problem cultivating mass in season 7; but he also seems to think that he can still wear all of his old t-shirts. Detroit spelled out in the shape of a gun is classic Mac and wore this one earlier in the series when he was considerably lighter, but what makes this shirt awesome is the fit on Mac when he transforms into his heavier alter-ego. 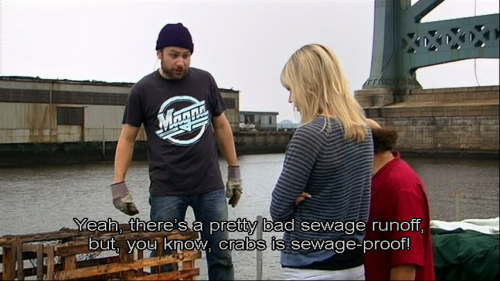 Although it’s rare to catch Dennis in t-shirts, Sweet Dee sports various tees in the show, sometimes against her will. Dee probably thinks she is too good for a shirt like this, but when the McPoyles force their sense of style upon the Gang, the guys end up in tighty-whities with bathrobes and Sweet Dee ends up wearing a pink Garfield shirt way too big for her. 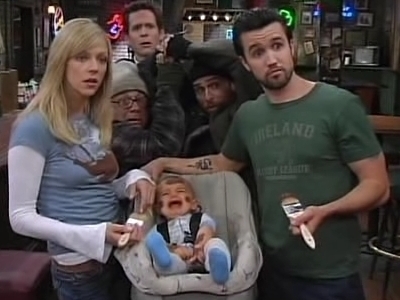 Dee’s narcissistic personality would never allow her to wear anything that wasn’t trendy or in high fashion, but thanks to everyone’s favorite creepy family from Philadelphia, Dee gets a taste of what it’s like to be a McPoyle girl in the episode, "The Gang Gets Held Hostage". A woman delivering a mighty slap to a dude is a complete reflection of Dee’s character. The rest of the Gang spends most of their time making poorly constructed punch lines about Dee being a bird with zero acting talent, not to mention they steal her car and blow it up, ruin her relationships with men and berate her dreams of being an actress. If anyone deserves to dish some open palm slaps, it’s Sweet Dee. The whole gang may have worn one of these in “The Gang Reignites the Rivalry,” but Dee gets credit for this shirt as she was the one who felt the need to prove herself after her humiliation in the previous Flipadelphia match. Excited for the competition, she doesn’t think twice to slip this one on for the competition, too bad she didn’t foresee getting poisoned by the rest of the gang. Visit T-Shirts.com, where you can find several of these It's Always Sunny in Philadelphia T-shirts and more.